Whichever team rises out of the Midwest will certainly have earned its Final Four berth. There’s a strong case to be made that this is the toughest of the four regions. Region of Doom, anyone? Whichever team rises out of the Midwest will certainly have earned its Final Four berth. 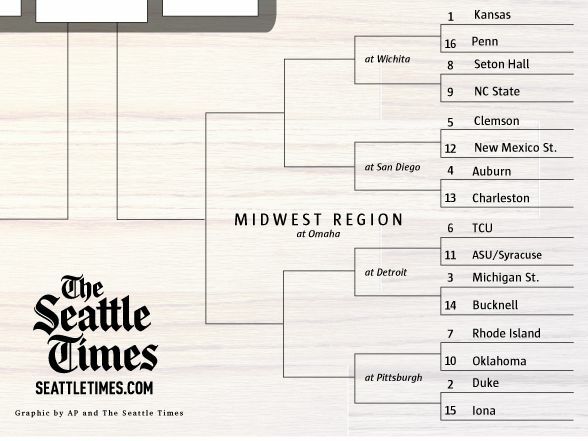 There’s a strong case to be made that this is the toughest of the four regions, with blue-chip powers Kansas, Duke and Michigan State holding down the top three seeds, respectively. Add in Oklahoma freshman sensation Trae Young, co-SEC champion Auburn and Atlantic 10 champion Rhode Island, and the road to the regional final in Omaha ought to be wildly entertaining. 21 Combined Final Four appearances for Duke’s Mike Krzyzewski (12), Michigan State’s Tom Izzo (7) and Kansas’ Bill Self (2), three of the most successful coaches in college basketball history. 20 TCU is making its first NCAA tournament in 20 years. 15 Auburn is making its first NCAA tournament in 15 years. No. 1 Kansas (of course): You might gander at the Jayhawks’ schedule and wonder how a team that lost to two (!) Pac-12 teams (Washington and Arizona State in early December) could get a No. 1 seed … and, well, you wouldn’t be the only one gandering and wondering. Alas, Kansas is a No. 1 seed and looks build to make it deep into March. No. 2 Duke (duh): Marvin Bagley is the best big man in the country not named Deandre Ayton, and senior guard Grayson Allen (if he can keep his cool) will be shooting for his second national title. No. 12 New Mexico State: The Aggies could be a trendy pick against Clemson in the always popular 12-5 upset. NMSU has won the WAC tournament title six of the past seven years and is also in the NCAA field for the sixth time in seven years. No. 10 Oklahoma: True, as a double-digit seed there isn’t all that far for the Sooners to fall. But consider how far Oklahoma has already fallen this season, going from a top-10 team and a potential national-title contender to a bubble team and a No. 10 seed. No. 5 Clemson: The Tigers are in the NCAA field for the first time since 2011, but they struggled down the stretch — going 7-6 since losing senior forward Donte Grantham to a season-ending knee injury in late January. Trae Young, Oklahoma: In January, the freshman point guard looked like he was going to run away with every national player of the year award. He has fallen back to the field some, though his 27.4 points and 8.8 assists per game (both of which rank No. 1 in the NCAA) grant him strong consideration for that distinction. Marvin Bagley, Duke: The 6-foot-11 freshman from Phoenix is in the running to be the No. 1 pick in the NBA draft this year. The ACC player of the year is averaging 21.1 points and 11.5 rebounds. 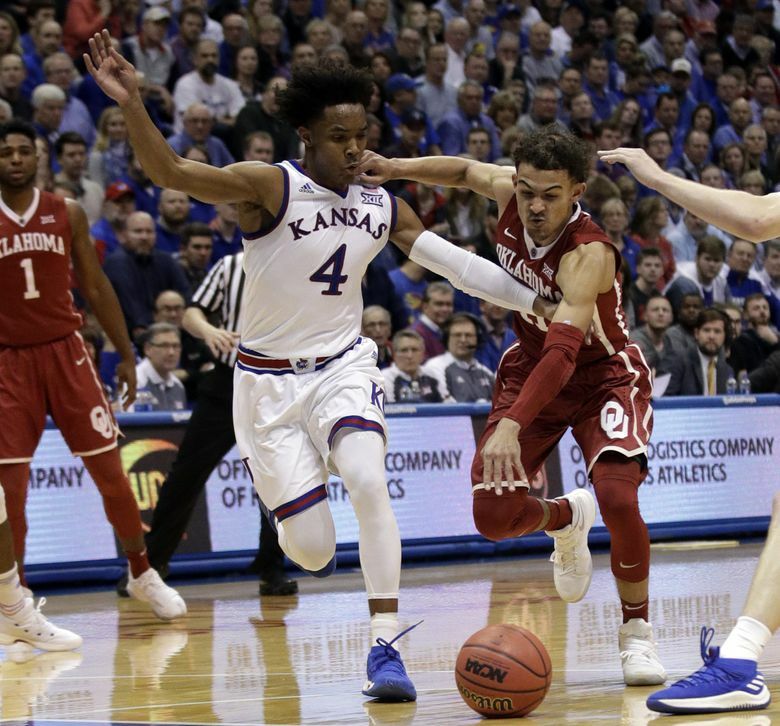 Devonte’ Graham, Kansas: The senior point guard led the Jayhawks to their 14th consecutive Big 12 regular-season championship, averaging 17.3 points and 7.5 assists. Mike Krzyzewski, Duke: You won’t find anyone cagier or better or more experienced than Krzyzewski, Izzo and Self, but what Jamie Dixon has done at his alma mater does deserve attention. After a great run at Pittsburgh — 11 NCAA tournament appearances in 14 years — Dixon has led a turnaround at TCU in just his second season there. Zach Lofton, New Mexico State: The senior guard has had a vagabond existence, starting his college career at Illinois State, then transferring first to Minnesota, then to Texas Southern and finally to NMSU as a grad transfer last year. It’s worked out for the Aggies: Lofton leads the team in scoring at 19.8 points per. Grant Riller, Charleston: Over his last 10 games, the sophomore guard is averaging 25.8 points per game and is shooting 55 percent overall this season and 40 percent on threes. Michigan State: Most years, a 29-4 record and a Big Ten title would net a top seed. The Spartans have the depth and experience to win a loaded region.